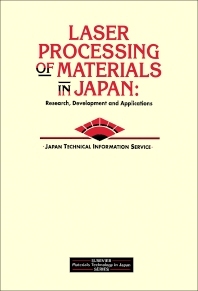 Up until now, information on Japanese research efforts in the field of laser material processing has been difficult to collate - LASER PROCESSING OF MATERIALS IN JAPAN provides all this information in one exhaustive reference work. The report describes the various Japanese techniques for the creation of advanced materials by using laser-technology, and details the laser generation equipment being developed in Japan. Also provided are the names and addresses of principal Japanese workers in a variety of laser-processing fields, together with lists of the main Japanese research initiatives. Introduction. 1. Government Scientific and Technological Policies for Lasers. 1.1. National projects. 1.2. Subsidies. 1.3. Joint study by universities and private enterprise. 2. Activities by Societies. 3. Governmental Scientific and Technological Policies. 3.1. Large-scale research and development projects by the MITI's Agency of Industrial Science and Technology. 3.2. Research and development using the science and technology promotion adjustment working fund. 3.2.1. Research goal. 3.2.2. Outline of research. 3.3. Special research funding. 3.3.1. Research on control technology of the laser chemical reaction by the chemical technology laboratory. 3.3.2. Research on new laser technology by the institute of physical and chemical research. 3.4. Laser research by the institute of physical and chemical research. 3.4.1. Members of the laser science research group. 3.4.2. Reports. 3.5. Summary. 4. Technological Details. 4.1. Present status and future trends in laser processing technology. 4.1.1. Laser cutting. 4.1.2. Laser welding. 4.1.3. Experimental laser processing. 4.1.4. New experiments. 4.2. Creation of new materials and substances. 4.2.1. Film creation by the light excitation process. 4.2.2. Laser annealing (high speed crystal growth). 4.2.3. Photo-etching. 4.2.4. Materials extraction, refining and synthesis. 4.2.5. Making metal alloys. 4.2.6. Summary. 4.3. Laser generator. 5. Market Trends. 5.1. Prospects for the machine tool industry. 5.1.1. Demand trends. 5.1.2. Technological trends. 5.2. Trends in the laser processing machine market. 6. Conclusion. References.